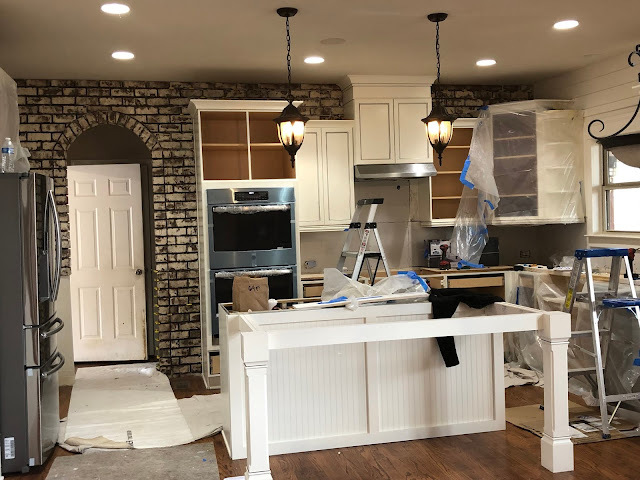 Time for a little kitchen update! We've come a long way since the start of the renovation in February. And looking back at our old kitchen it looks like a totally different house! We're in the home stretch now and about 98% finished, but wanted to pop in to give you a little peek at how it's gone the last few weeks. 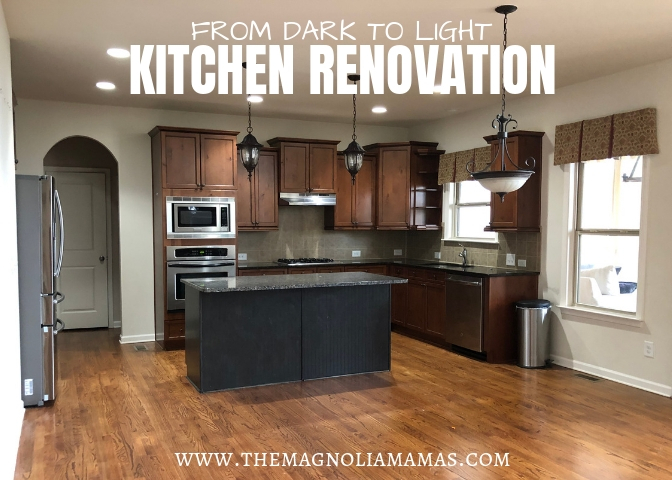 A lot changed about our original scope of work, and a kitchen update has now turned into an entire main floor renovation. Stay tuned for more on that, but for now...the kitchen! Week 3 they started to put up the brick wall and back splash and it took a good week to finish. It's my absolute favorite part of the entire kitchen. We went to Mardis Gras in New Orleans during this time and came back and it was all finished minus the backsplash area above the stove. This was the beginning of our major changes though. 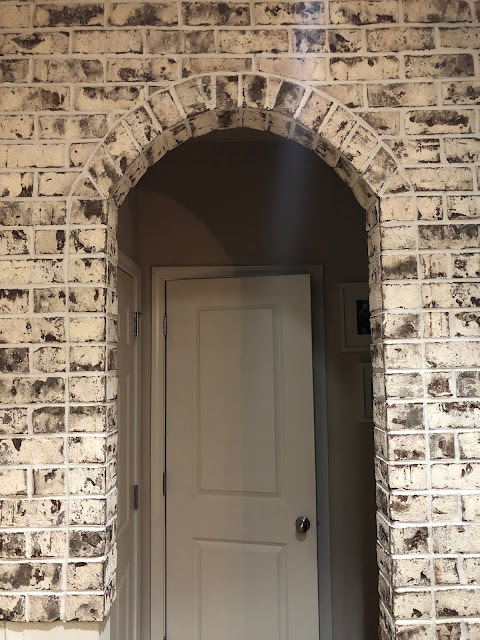 Once we saw that brick we fell in love. We asked our contractor if we could change the floor in the pantry/backpack wall/laundry room to the same brick. And our door frames and windows in the entire house to match the kitchen ones we installed. Our brick wasn't able to be used as a flooring in our particular house just because of the width of our subfloor. 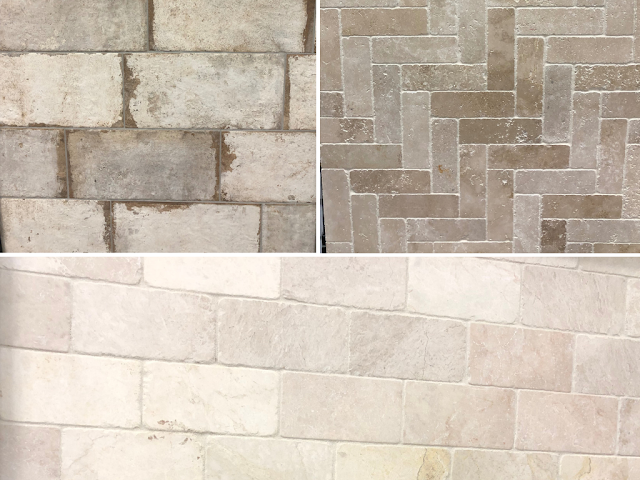 We didn't want to make an entire main floor flooring change (because the money train has to stop somewhere), so we opted to pick a brick-like flooring to coordinate. Off to Floor & Decor I went. They had so many pretty things. I could have redone a whole house there! Also known as "the week we changed our countertops three times". That's right. We changed them three times. First, a little back story. We were asked to pick out our countertops in week 2. All the samples of everything we had picked were pretty small. 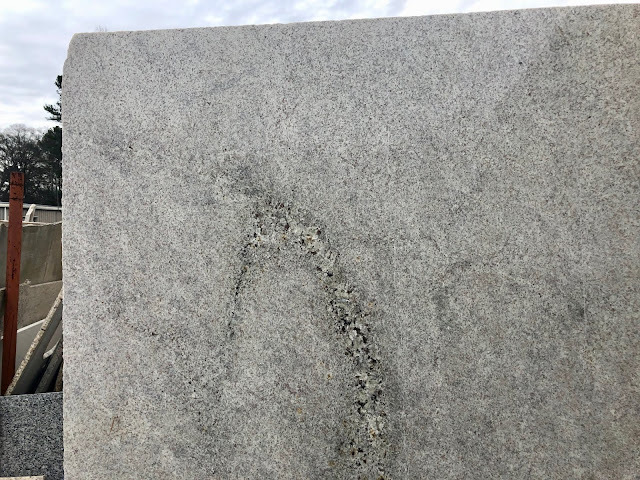 Once everything started to come together in the actual kitchen we realized the granite we picked wouldn't coordinate like we wanted to. It pulled a lot more grey and was a lot "busier" than we intended. So we went back to the countertop drawing board. And we went back again. We finally decided on a quartz countertop that we wouldn't have a heart attack on cost, and decided that was our final decision and there would be no go back-sies. There were two options and when pricing came back the bottom square (Blanca Statuarietto) was almost half the cost of the top square. It was a no brainer. The nice thing about quartz is they can make it extremely fast. Within a few days we had our new counter tops in. It looked SO GOOD! And then we looked closer. And then we looked at our pictures we had from the samples. We realized they installed the "Virginia" quartz instead of the "Blanca Statuarietto. We had a small panic attack because of the pricing, but a quick call and our contractor said, "No this is the correct one at that pricing." What ever happened in translation between us, the contractor, and the distributor we aren't sure. All the paperwork we received says one thing, but who are we to argue nicer more expensive counter tops at a lower cost. Especially after installation. Because the countertops were installed that meant our copper sink and our faucet were installed too. Doors and drawers were put back on and our kitchen started to resemble an actual kitchen again. My washer and dryer were in the kitchen. With loads in them. But that meant our laundry room flooring was being installed so I got over it quickly. I was ridding my house of that ugly so what was a little (a whole lot) of wet laundry? I got a little over excited and ordered our new counter stools one night. They made a brief appearance before going back in the boxes for a few more days while painting and such was going on. But they are pretty. Cabinet hardware was up next and it was a pretty easy process. We just went to Home Depot and grabbed a few options they had in stock to choose from. By this point we (and by we I mean "I") we just wanted something quick and easy. Luckily the first pulls we picked matched perfectly and were the right size for our needs. We chose the coordinating knobs for the drawers and all was well in the kitchen hardware task. We are in the throws of week eight now and I haven't taken any pictures of in between because the tasks that have been done haven't majorly changed anything. Our door frames, baseboards, and windows have all been updated and painted. Flooring is finished and I'm happy to say we are back to business in the laundry department. It was a messy process, but the outcome was worth it. Next week we should be all finished and my next update will be the final product. I can't wait to share with you!